After the occurrences of the past 2 days, it appears that the whole gaming industry has been getting sued. Fortnite in particular has been hit with a lot of lawsuits from celebrities who want recognition for their dance in the viral sensation. The next to hop on this bandwagon is the mother of the Fortnite superfan known as Orange Shirt Kid. 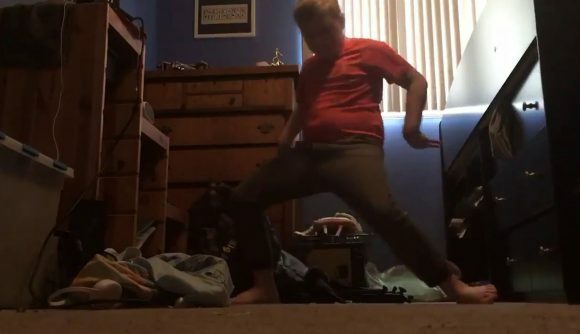 For those of you who do not know, Orange Shirt Kid went viral when he attempted a strange dance, to try and win a Fortnite Dance challenge. There was an outroar on the internet when the fan favorite child did not win the challenge, and his dance didn’t get submitted into the game. His dance was later included in the Season 4 Battle Pass as “Orange Justice”. It was available for everyone who reached Tier 25 in the free pass. The name symbolizes Orange Shirt Kid getting the justice he deserves, by having the Fortnite creators finally put his dance into the game. All parties were happy, and Orange Shirt Kid was ecstatic that he was recognized in the game he loved. Almost a year later, it appears that Orange Shirt Kid’s mother has caught on to how much money they COULD have made. I am not here to speak on if this lawsuit will work or not, but to seek Orange Shirt Kid’s opinion on the situation. GameZap personally interviewed Orange Shirt Kid in his live chat room, and asked him his thoughts on the lawsuit. Orange Shirt Kid never finished answering the question, but it feels like there is more to the story than has been revealed by the public. We did not get very much from this quote, but I get the sense that Orange has mixed feelings about the lawsuit, as he is a superfan of Fortnite, and does not want the company to fail. He also wants his family to be well off and happy. Lots of Epic Games fans are coming after Orange Shirt Kid in his live chat, which is unnecessary. Orange is a kid who loves the same game they do, and has no say over what his parents do. It is unknown if Orange is referring to the lawsuit, Epic allegedly tampering with his account, or being interviewed. Not too much has played out in the story, but GameZap will keep you updated on all parts of the story.